The last crypsis challenge was surprisingly difficult, but I think this one might be easier. What has hidden itself here, just where an unsuspecting tourist might place their hand? A general description is fine, although I suspect someone will know exactly what this is. 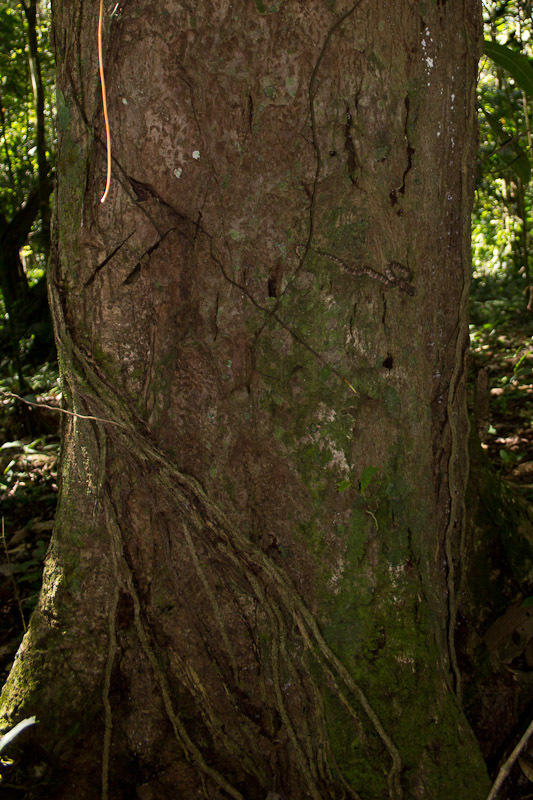 Is it a snake in the middle of the tree trunk? Has to be the snake! Oh, man – is that a Bothrops? Close, it is a pit viper, but not that one. Kinda hard to tell, but based on the slender build, stripes and bug-eyed head, I’m guessing Immantodes? Though it might be some kind of Bothriechis, as well. lateralis, maybe? Right genus, wrong species. You almost got it. Well, there are only so many arboreal vipers, you know? You can’t really tell the scale here, but it’s much wider than Immantodes. I did find one of those though, and I’ll post about that separately at some point. This snake is around 1 foot long. This challenge must indeed be easier. Everyone is seeing the snake.